Before February 2010, Chris and Jeremy had to jump through hoops to change old Cleveland ordinances and rules about mobile truck food. Finally in February 2010 permit in hand, the Dim and Den Sum truck, the 1st mobile food truck in over a decade, rolled onto the roads of downtown Cleveland to feed hungry and adventurous lunchers from City Hall to the Cleveland Clinic, to the Cleveland Art Museum. People of Cleveland love this food truck. Ever since I caught wind of this truck, I have been on their Facebook and Twitter feeds to let me know where they are going to be each day they are making lunch. Actually, that is the only way to find out where lunch is from Den and Dim Sum, it is by electronic means, Twitter, Facebook, or the banner on the front page of the DimAndDenSum.com website. The gig at Dim and Den Sum is that they try to use some locally grown food in every sandwich or wrap they sell. The food is Asian Fusion. On this day, I got a Rib Sammich which is pulled pork rib meat with Asian fermented black beans, topped with marinated heirloom local tomatoes and fresh local sweet pepper slaw. I also got homemade bison gyro wrap with local heirloom tomatoes, homemade fresh local cucumber pickles which were lightly brined, spinach and gyro sauce. They also offer jarritos sodas. I really liked the fresh locally grown vegetables on my sammy and wrap. I think the vegetable preparation and marinades or pickling added to the success of the sandwiches. I wish this Asian Fusion food truck would come to Nashville because it is not just another taco truck. I was told that I was trying the "new menu" items. There seemed to be a little confusion from the regulars mulling around. Every single regular asked where the PBLT was. There wasn't a sammy like that on this day. The PBLT is a pulled pork, bacon, lettuce, tomato and sriracha mayo sandwich which seems to be a favorite. The air around the the truck seemed to be resignation to try another sandwich, but every single regular requested the PBLT be put back on the menu. One week after this lunch day I had, Dim and Den Sum put the PBLT back on the menu. Judging all the chatter amongst the diners about the PBLT, I would suggest that the PBLT be a regular item, and never be taken off the menu, even if the other items change. On this day that I happened to be flying in to work in N. OH, I had just enough time to find the Twittered location and get lunch. 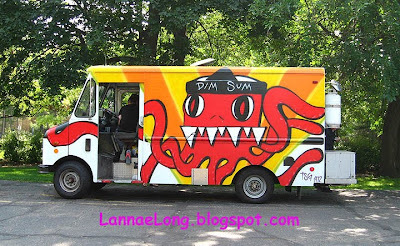 This particular day, Dim and Den Sum was parked in the shade by the CIA, the Cleveland Institute of Art. Lucky for me, school was not in session yet, so I was able to find street parking quickly. CIA is across the street from the Cleveland Art Museum and next to Case Western Reserve. The roads in and around the museum, CIA and CWR are part of an old-school (literally and figuratively) city park layout. It is an oasis from the multi-lane urban roads such as Euclid and Chester. This little section of Cleveland does not follow the grid pattern of roadways, rather all the roads are curvy and windy, and it is possible to get a little turned around inside this oasis. I met a couple of Den and Dim Sum regulars including Austin and Stuart. Stuart takes a lot of photos of his food, and his flickr site has over 17k. It is rare for me to run into people who photograph their food like I do, so it was really a pleasure to meet someone else who likes to do the same. He eats out a lot in Cleveland and he knows of tasty places to eat. He recommended a couple places to me, which I will have to catch on my next trip to N. OH. 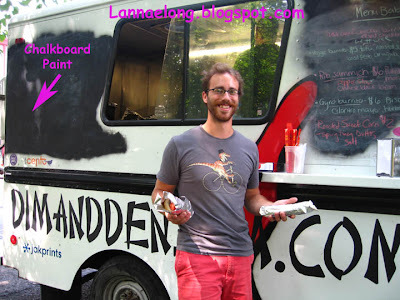 Austin was also eating from this food truck, and he happened to be the very first customer with his buddy in February 2010. He happens to work near CIA, so he just biked over to the truck for lunch, and got the same exact food I did. 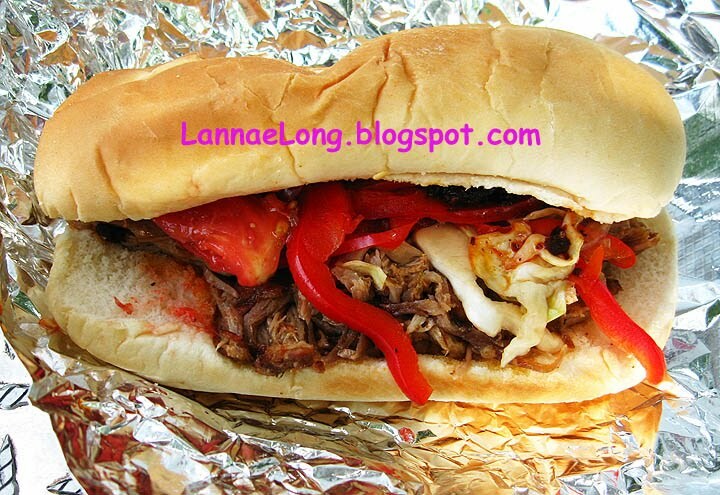 We both really liked the rib sammy because the flavors are just so perfectly balanced with sweet, salty, and sour. It was fun to learn a little about Austin's life style, he does not have a car and bikes everywhere, even in winter. The buses in Cleveland like Nashville have bike racks, so in the winter Austin will take the bus with his bike, or just take the bus. He lives on the west side of town near an area with a bunch of ethnic restaurants, and a bar, restaurant, nightclub that has been continuously open and running for over 40 years. I did not get a chance to go to that establishment, and forgot to write down the name. Is it Steves? Anyone out there who can help me out with that? I would like to go to some of the restaurants he mentioned and this nightclub in the west side, so anyone? anyone? I didn't write any of these down. Austin, if you read this, comment and tell me again! Get on the tweet, get on the facebook, get on the website, and find out if Dim and Den Sum is going to be in your neighborhood. Go get yourself a tasty treat, meet people in your neighborhood or other working stiffs near you. It is a lot of fun. Thank for the post..we're stopping in Cleveland to visit the in-laws in a few weeks, hopefully we'll get a chance to eat here. Have you had a chance to try Slyman’s yet? OMG - the PBLT sounds amazing! So glad they put that back on the menu - I'm definitely gonna check them out. Pete, get on the tweet or Facebook and check out Dim and Den Sum. 1 sammy or wrap is good for a light lunch, so you may want to get 2 if you are hungry. And THANK YOU for the Slyman's tip. I have driven by this place perhaps a dozen times, and it doesn't look like much, but the website corned beef sandwiches look awesome! Again, I should not judge a Cleveland Book by its cover. I am going to try this place during my next trip coming up soon! THANK YOU PETE! Adding them now, thanks again. Please do! I know this is stretching it, but if you're a fan of corned beef, it's quite possibly some of the best in the country. We try to go to mostly deli's in Cleveland since we really don't have a traditional one in Nashville. We had a really good meal last visit at Jack's Deli in University Heights. It's a bit outside of the city, but well worth the drive. Pete, I want you to start your own food blog! I want to see where you are eating in Nashville and Cleveland! I love Cleveland, I think it is a delicious city. Top 10 Food Blogs in Nashville!